Measuring radioactivity from radon is potentially very confusing for the lay person for several reasons. One of which is that there are several different units of measurement depending on the application, era of standards and preference based on world regionalisms. 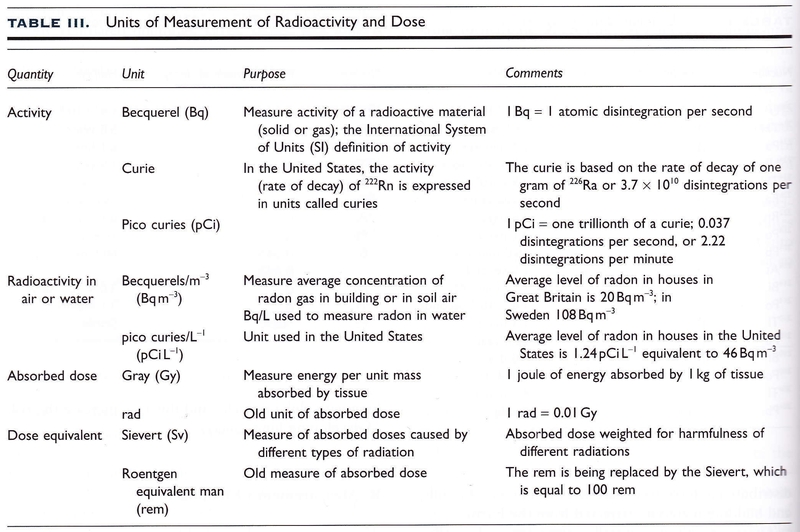 Applications include activity, (which radon measurement falls under) absorbed dose, which is the measure of radioactive energy absorbed by tissue per unit mass and dose equivalent which is the measure of absorbed doses from DIFFERENT types of radioactivity such as alpha, beta, and gamma radiation. Many scintillation meters still measure this in the older measurement unit rem (Roentgen Equivalent Man) or microrems for gamma radiation. For instance, when measuring radon, North America prefers to use the picoCuries per liter (pCi/L) designation as opposed to Becquerels or Bq / meter^3 which is typically used in Europe and the UK. These both measure a specific number of atomic disintegrations per volume of space. In the case of the Becquerel, this is 1 atomic disintegration per second or 60 events per minute. For a picoCurie, this is translated as 2.2 radioactive disintegrations per minute. A convenient conversion chart is shown below. As an added note, a little known unit of radon is what is known as a Working Level (WL) which is the quantity of radon that will produce 1.3 X 10^5 MeV (Mega Electron Volts) of potential alpha particle energy per liter of air. A single WL of radon is equal to the RDP’s (Radon Decay Products) in equilibrium with 100 pCi/L of radon. Because the equilibrium value for RDP’s for indoor environments is typically 0.5, radon concentrations of 1 WL would be around 200 pCi/L. This entry was posted in Indoor Air Quality (IAQ) Testing, Radiation & Radioactive Materials Testing, Radon Testing Services and tagged Alpha, Becquerel, Beta, Curies, Gamma, Geiger Counter, Grays, Radiation, radon, radon testing, rem, Roentgen, Sieverts, X-Ray on February 12, 2014 by admin.